Volvo Trucks is currently getting ready to release its new FE Hybrid truck onto the market, so naturally the vehicle had to first pass a rigorous crash test regime. The engineers had to face new challenges as the battery pack is fitted at the side of the vehicle, unlike conventional-powered trucks. 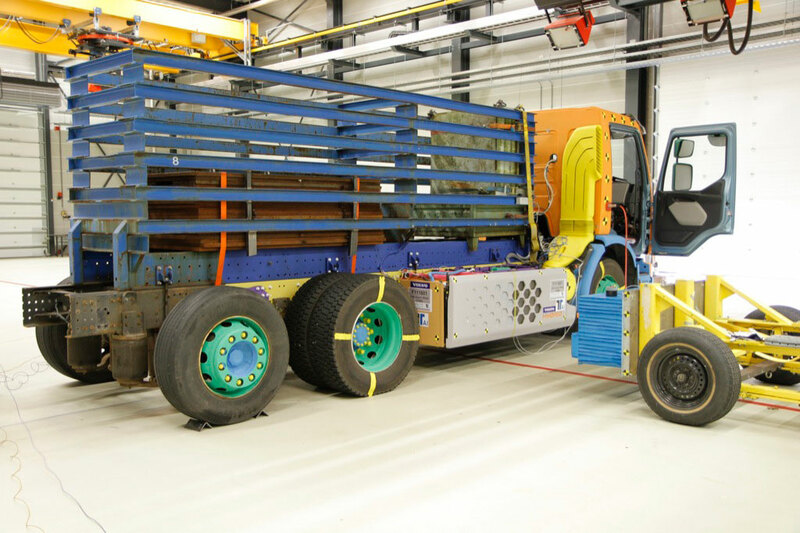 This was the first time that Volvo carried out a crash test on a hybrid truck. The hybrid model was tested by simulating a collision in which a car hits the side of the battery pack at a speed of 46 km/h (29 mph). "This is a common accident type in city traffic, where this type of truck will see most service. The scenario is a car that goes through a red light and drives into the side of a truck," said Carl Johan Almqvist, Traffic and Product Safety Director at Volvo Trucks. The battery pack weighs 578 kilograms and the battery itself weighs 232 kg (511 lbs) . The electrical system operates on 600 Volts. “We decided to carry out the test during the 45 seconds that the battery is being charged. That is when most current passes through the system and we can obtain the ultimate test result," said Ulf Torgilsman, who is in charge of crash tests at Volvo Trucks. After the 1600 kg (3,527 lbs) car sled hit the battery pack, the assembled engineers saw that the installation met all expectations. The built-in safety system shut off all activity in the battery pack. "The test ran perfectly and everything worked exactly as planned. We saw that the battery pack is immensely stable. No thermal energy was generated, there were no fires, no fluids leaked out, the electrical system remained intact and it shut down exactly as it was supposed to do," said Torgilsman after the crash-test. The test demonstrated two main things: that the battery pack withstands a collision without causing a fire, and that the car driver is not injured by the battery pack. The Volvo FE Hybrid truck is thus now safe and ready for market launch.